The Princess Y-Guide Program was developed by the YMCA as a way to support the father's vital role as teacher, counselor and friend to his 6-9 year-old daughter. 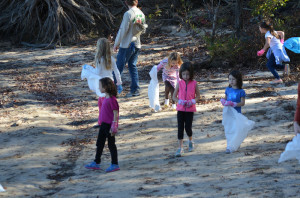 The Waco Tribe of the Chapel Hill Y-Princesses wanted to clean an area of Jordan Lake for their service project, so Phil Rodgers, chief of the tribe, worked to develop the event with Van Murray a CJL coordinator. On November 10th, 11 Dads brought their 13 daughters to Crosswinds Campground for a "hands on" introduction to environmental stewardship. Several unique organizational challenges were successfully met in hosting our first event with such young children. We found a cleanup site where terrain was not difficult, provided smaller than usual trash bags and the volunteers brought small gloves. The group focused on the most trashed area which is to the west of boat ramps extending up to edge of Farrington Rd. Like other areas of shoreline at the southern end of the lake, rainfall events not only cause the lake level to rise but also to bring the trash up into the woods, especially in low lying areas. Phil Rodgers said "I was extremely pleased with the involvement of our Tribe, and how enthusiastic all the girls were to get the work done. Afterward, we enjoyed snacks at the Crosswinds Boating Center marina and went out on a pontoon boat for a few short rides with rental donated by Crosswinds Boating Center. All our girls and Dads had a great time and I think they feel like they really contributed to helping keep our land looking good." These young volunteers and their Dads collected about 15 bags of trash, a large plastic bench, a rug and plastic spools. Congratulations for a job well done!